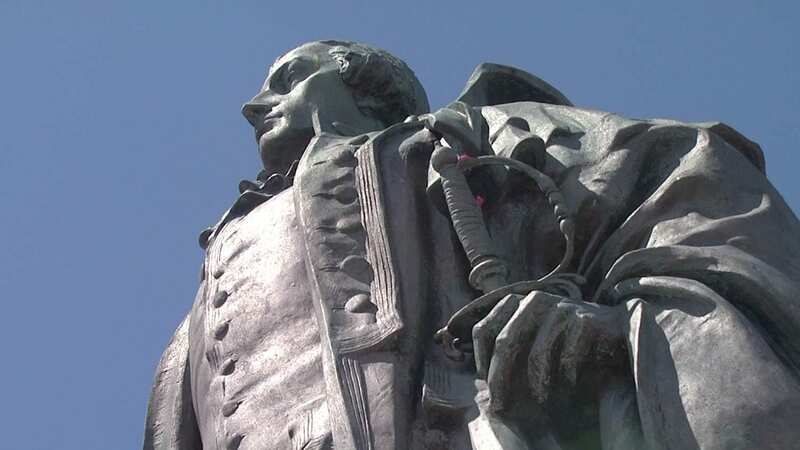 One side wants the statue of the former Nova Scotia governor taken down now – the other wants to negotiate with the City of Halifax on its fate and let the municipality draw up the schedule for removal. That is the scenario playing out in Halifax over a monument of a man who, on one side, has been credited with building the province – and on the other, of genocide against Mi’maq people. “The Elders request that Mayor Savage announce within twenty-fours their plan to take down the Cornwallis statue and to replace this with a monument honoring the Indian Residential Survivors as recommended by the Truth and Reconciliation Commission,” wrote Elizabeth Marshall to the RCMP. In the letter sent Wednesday, Marshall was appealing specifically to Sgt. Darren Bernard, a Mi’kmaw member of the RCMP to enlist “the help of Canada” to ensure that Saturday’s planned ceremony at the site of the Cornwallis statue in Halifax is peaceful. “This effort to address the genocidal symbol which Cornwallis represents initially had started as a “protest” to address the violence committed against our women on July 1st by members of the Canadian Navy who call themselves the “Proud Boys,” wrote Marshall. “Our decision to conduct ceremony at the site of the Cornwallis statue has grown into a movement, way beyond anything we have every encountered in our past efforts to uphold our Treaty and Sovereignty. We did not anticipate the amount of support we have received to date, nor did we anticipate the bold contempt of racists and neo-nazi groups who are publically threatening violence against us women on July 15th at Jipuktuk. On Saturday, Marshall and her group are planning a ceremony for the peaceful removal of the statue. Whether that means the group will be attaching ropes and pulling the monument down or not isn’t clear. Regardless, forcing the issue with the city isn’t the tack that chiefs of Nova Scotia want to take. The debate around Cornwallis, and the statue, has been raging for years. Cornwallis is infamous for payment to settlers for all Mi’kmaq scalps. Names on public buildings are coming down – but at a snail’s pace. The last was the removal of the name from a public school in Halifax. The name was also removed from a river in Nova Scotia by the province. Premier Stephen McNeil has also asked the mayor to remove the statue. 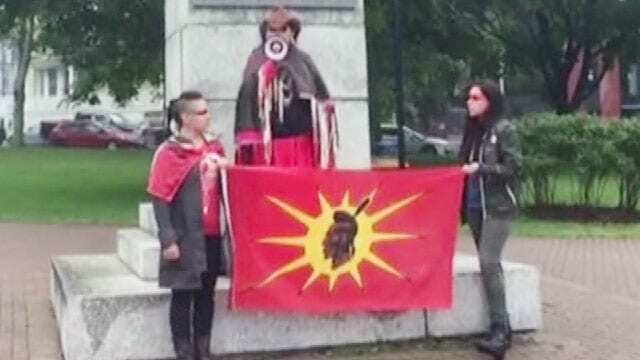 The latest run in over the statue, and what it represents came on Canada Day when a Mi’kmaw ceremony was interrupted by a group of men who called themselves “Proud Boys.” While the conversation between the Mi’kmaq and the men, who are also in Canada’s military, remained calm, the message being sent to the Mi’kmaq was clear. Marshall said in her correspondence with the RCMP that she has tried to talk – and the time for talking is over. But chiefs see this issue as a time to build a bridge – not tear down a statue. Compared to the past, the relationship between Mi’kmaq leadership, the province, and city of Halifax has never been better. And it seems by the statement from the Chiefs of Nova Scotia, they want to keep it that way. “There is a process to engage with one another, and while this may take time, it does not mean that work is not being done. We will continue discussions with the Halifax Regional Municipality on this and many other issues that involve the Mi’kmaq of Nova Scotia. 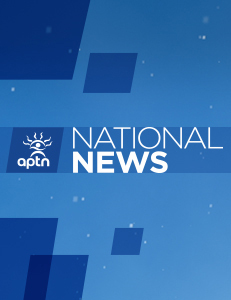 While we respect the right to protest, we also want people to know that our primary concern is for the safety of our people,” said Chief Deborah Robinson. The grassroots organizers of the movement to remove the Cornwallis statue say that process will take too long and the outcome isn’t clear. Patles is urging people to contact the Halifax mayor to express their concerns and views. As a settler I believe I have a responsibility to support the Chiefs of Nova Scotia in their measured response to the municipality removing the Cornwallis statue ” in good faith and out of respect for Mi’kmaq concerns.” The Chiefs emphasize their concern for the safety of all people during this process. They say that “when we work together we can go further”. Chi migwetch. For true reconciliation all sides should apologise for the horrific things that were done in the past, I find it interesting not 1 First nation band has apologised for what they did. The French offered bounties for British scalps at the same time Cornwallis did, First nations were heavily involved in slavery , the land the Oka crisis was fought over was stolen from the Wyandot people by the Mohawk, these are facts no one wants to talk about. The residential schools were horrific no question about that and history should never forget that, but lets also talk about the scandal of bands getting millions in government money yet some band members don`t have clean drinking water and they`re blaming the government. Just like in wars both sides do bad things but as always the first casualty in war is the truth. I agree Bails, …….. all this happened so long ago, history is full of mistakes, and wonders. Good and Bad, that’s how we learn. It will also teach our children’s children long after we go!!!!!! I am from Vancouver,Canada and I wanted to say that I agrees with the Mi’Kmaq in taking down the reactionary, racist statue of George Cornwallis.That statue is an insult to all Native People in Canada and should be removed. In South Africa students there took down a statue of Cecil Rhodes about a year ago.He was a reactionary,racist person like George Cornwallis.It is time for the statue of Cornwallis to come down to.If the Gov’t don’t take it down the people should.In Vancouver streets and schools named after William Gladstone should have their names changed. William Gladstone was prime minister of England during the 1860s. He supported Slavery in the southern USA at the time.Gladstone also treated the Irish people like slaves during his period as Prime Minister. I pray that there can be reconciliation, I wish that there could be an overhaul of the entire construct of “Canada” and that there could be a new council, where equality could be a reality. Of course the colonizers will not surrender, but to give up some power to reconcile and give indigenous people at least half of the power and have a real council. Where people will be represented fairly, not just the few who have money, not just those with pale skin but all people. By continuing under the umbrella of “Canada” without reclaiming, only serves to further this agenda of colonial ideology. How can we stop the destruction of the land, if the power to do so resides with a system that is based on a conquering mentality that sees land only as a resource to be capitalized on, and will not take swift action because it operates with a heart of greed? Not quite; only the *signs* at the bridge near Annapolis Valley First Nation were removed, in 2015, at the request of elder Daniel Paul. Applying the original, historic, Mi’kmaw name — Jijuktu’kwejk — has not yet happened. Put there by CORNWALLIS. And remove this Symbol of hatered.called a monument to CORNWALLIS. We don’t honour genocidal work, we study the history and hope to learn better. Put that homage to atrocities in a museum for that purpose. It does not belong in a place of honour or celebration. Venerate the fallen and the survivors in its current public place. The Mi’kMaq have perpetuated atrocities and scalping but you fail to address this in anything you say. Why can you not have a forgiveness ceremony.This will only start a war that ended over 250 years ago. Who will speak for the souls of the men, women and children slaughtered and scalped by your people in Dartmouth on May 13, 1751. Tearing down is a very poor way to reflect on reconciliation and your culture. If there is nothing but hate in your hearts so be it but don’t justify it by tearing down.